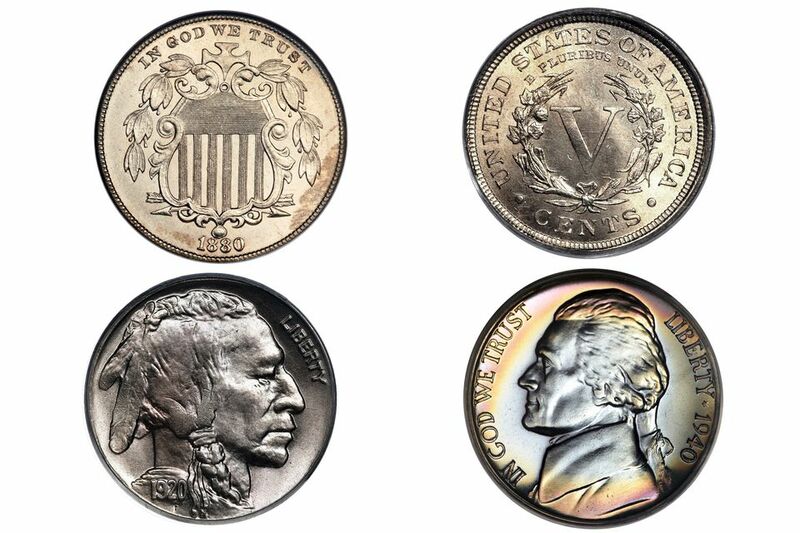 The U.S. nickel values and price tables listed below have coin values and prices based on how much you can realistically expect a dealer to pay you for your nickels if you wanted to sell them today. When you try to determine the value of your nickels (or any other coins), keep in mind the difference between price and value. There is nothing worse than counting on your collection being worth a certain amount of money, and then getting a very rude awakening when you go to sell it, all because you consulted the wrong type of coin value guide when you made your appraisal. Jefferson Nickel values are so low that I feel they represent an excellent investment opportunity in the highest grades. Jefferson nickels are one of the best coin types for new collectors because you can just about complete the entire Jefferson Nickel series right from circulating coinage! The only ones you won't usually find in pocket change are the silver wartime issues, from 1942 to 1945. If you know a young person who might enjoy coin collecting, why not learn how to start a coin collection on $4. Buffalo nickels, on the other hand, are very popular, but I still feel they are somewhat undervalued. Buffalo Nickel values are disproportionate to the mintage figures in many years; in other words, just because fewer Buffalo nickels were made one year doesn't necessarily mean that year's nickels are more valuable. I feel that low-end Buffaloes are valued too high, but on the other hand, I feel that the highest-grade Buffaloes are a good investment. Liberty Head or V-Nickel values are slightly more in line with what you would expect for coins of that period, but I believe they are undervalued. I also think that there are a lot of errors and die varieties still to be found in this series, since other coin types from this period exhibit many interesting varieties. I have always been a big fan of the reverse design on V-nickels for some reason. I don't know if it's because I like the directness of the big V, or I am drawn to the general art style of the reverse. Regardless, V-nickels are my favorite nickel. The Shield nickel is an interesting type, having no portrait and a big "5" surrounded by stars on the reverse. However, most coins start at least $20 for very worn out (G-4) specimens, so they are too expensive for most beginning coin collectors. However, intermediate and advanced collectors may find this United States coin series challenging and interesting. The United States Mint produced all Shield nickels at the Philadelphia facility. Therefore, a date set would only consist of 16 coins. In average circulated condition it would cost approximately $2,000 to assemble a complete set of circulated coins. Finding the1883 2 over 3 variety may be a little challenging, but doable. What's the Story Behind the 1913 Liberty Head Nickel? How Much Is My U.S. Proof Set Worth? How Much Money Are Your U.S. Proof and Mint Sets Worth?